Adding splashes of color to your surroundings creates visual interest while allowing you to express your personality. Our luxury Springs Apartments homes are designed to serve as the perfect backdrop for any type of decor scheme. You don't need a paint brush to incorporate color and patterns into your home. Get inspired with some of the easiest and most creative ways we've seen to brighten up any room. Floors are often overlooked as a decor element. Area rugs provide texture and depth, and they're also a nice way to define sections of a room. Throw pillows come in an infinite variety of colors and patterns and they're inexpensive, so you can change up the look to match the season or just your current mood. Soft, cozy blankets draped over the back of a couch or chair make great wraps on a chilly evening. Place arrangements of fresh or artificial flowers in the center of your dining table or on a night stand. House plants give a lush feel, and as a bonus they're good for your health. Studies show that indoor plants like dracaena and English ivy filter out ozone and other pollutants in the air. Posters, paintings and other wall hangings open up numerous style options. Make a bold statement with peel-and-stick murals that can be easily applied and removed without damaging walls. Create a wall collage of favorite photographs with picture frames in a variety of colors and shapes. For the ultimate in personal style, try your hand at some DIY wall art using offbeat materials such as clipboards, painter's tape and a potato "ink stamp." Bank some "green" karma by giving new life to an old piece of furniture. With a little TLC, an end table or dresser picked up at a flea market or resale shop can become a colorful accent. Neutral wall tones provide an opportunity to go colorful with couches or armchairs. 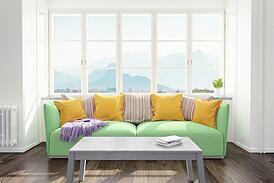 Bright furniture makes a compelling focal point, so choose accessories carefully to avoid sensory overload. Have a favorite decorating tip to share? Tell us about it in the comments!